This is a story about what I hadn’t seen but could imagine. It started when my wife announced, “I saw two deer crossing the lane, at the railroad crossing”. I thought, why not? I’ve been a regular visitor for a decade and I’ve not seen any trains using it, so why not let it be a deer crossing? The next morning I drove over the track, bump, bump, parked, and stood at the edge of the crossing on an iron rail that went off in each direction along roadbeds that looked straight, solid, and empty as far as I could see. A train emerged in my imagination, its cyclops eye growing closer and closer, coming from the south, bearing down on me. Childhood memories returned, my brother and I watching an empty track, then blurting out “Billy Goat!”, “Billy Goat!” as we sat in the warm Southern California evening, watching a train approach. Dad had taught us to look for the majestic Great Northern symbol, standing atop his peak, emblazoned on the sides of railcars. It was a reminder of his childhood around Seattle. We’d slurp root beer floats while waiting by open car windows, hoping to capture glimpses of that elusive Glacier National Park denizen. We’d see the headlight, hear the blares of the horn code Lonnnng-Lonnng-Short-Lonnnng rise in pitch as the anonymous engineer brought his locomotive in front of us. The engine would make the ground shake as it spewed diesel exhaust and as it powered blurred piles of commerce, gondolas, boxcars, tank cars, flat cars, vehicle cages, and containers toward their destinations. Then the train disappeared and I heard the sounds of a small tractor. Its driver, clad in a cowboy hat and a plaid shirt, had stopped to wipe his face with a bandana, letting the machine idle. When he restarted, the engine strained as a hay bale was lifted, picked up along a neat line of bales. In the distance, along a country lane, more bales were stacked, being loaded onto a large flatbed truck, whose color had faded into the past. The tractor was working in a small fenced field, one of several along the track. Some had hay in various stages of gathering. Others were unplanted and rocky. Still others had marshy areas. Modest houses bordered the fields. Around these fields was more equipment, tillers, cutters, rakes, balers, riding lawnmowers, tillers. A few cattle grazed. The land was quiet, small, sufficient, humble. This seemed like a place of trucks, not trains, of individuals, not syndicates. I drove back to our RV, asking why the track? 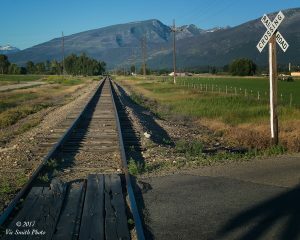 I went north, following the track, along the valley of the Bitterroot River. The rails seemed functional. Then short lines of hopper cars started appearing, stretching into the distance. Their connections had been broken where driveways and side roads went over them. This looked like a parking lot for spare rolling stock. The track was blocked. I went back south and asked local people about the it. “Been here ten years, never seen any trains” said one. Another said that there used to be a few. A third, with the longest contact, said that there used be lots of trains. Most said that those seconded hoppers, tagged with political graffiti, were a travesty in a land where people treasured their rural purity and avoided political discourse. The graffiti was a far cry from the noble billy goats I had treasured. I went to the papers, looking up the story of the track. It was built as a spur line, a connector to the main that ran north of here. By 1905 it had been stretched 70 miles south of that main line. Traffic remained steady into the 1990’s, mainly to haul lumber harvested in the mountains. In 2000, traffic surged to 1,000 cars each year to carry fire-scorched salvage logs after fires swept through the mountains that year, leaving snags and damaged watersheds. Floods, roaring out of the damage, eroded the track. Traffic slowed to 34 cars in 2011 and the line was decommissioned. The track headed south, toward its end, its past. I followed it, as if on a treasure hunt. It went atop solid roadbed, through stands of tall grass, across asphalt-covered crossings, under a tubular metal fence, and into the edge of a large empty field, the end. As I looked across the fence I saw the site for a former lumber mill, one of 26 in the vicinity, and remembered stories I’d heard about those times. I imagined the sights, sounds, and smells of activity. I imagined a long train parked just beyond my position, being loaded with lumber treasure, to be taken north across the crossing for mineshafts, head frames, bridges, fences, buildings. Just north of the mill was the site of the first large public land timber sale, 40 million board feet, 8,000 truck loads, from 3 sq miles, enough lumber for 4,000 houses, 2,400 sq ft in size. It was the start of a timber boom that lasted for decades. But gradually the forest changed. Understory fire was suppressed, replaced by stand replacement fire storms. Big trees became scarcer, choked by thickets of scrub. Public land priorities changed. The Land became more valuable than the timber. Booms are big and showy and what’s left in the rear view mirror is often ruin. People scramble to survive. Some, like my wife’s family, stay. Others move on. Memories of olden times harden. New people arrive. Blame is launched. When the sound of this boom faded, the track I’d followed and its crossing were no longer needed. But my imagined train was still real, it still rumbled, and it still shook the land around it (that’s a different story) as I waited for deer to cross.